The Holland Land Company records on microfilm comprise materials relating to the United States investment activities of the Holland Land Company, an early 19th-century Dutch conglomerate of six Dutch banking houses. The microfilm records held by Reed Library span the years 1789-1869. The reels were created from original documents held by the Municipal Archives of Amsterdam in the Netherlands with the permission of the Municipal Archives and the assistance of Nederlandse Document Reproductie B.V. Image: Map of Morris's Purchase or West Geneseo in the State of New York, ca. 1814. HLC Map 0097, from Archives of the Holland Land Company microfilm collection, Reed Library, State University of New York at Fredonia. Courtesy of State University of New York at Fredonia Archives & Special Collections; Municipal Archives of Amsterdam; Nederlandse Document Reproductie B.V. Patrons may access the microfilm reels in the Microforms Room of Reed Library during normal operating hours and do not need to schedule an appointment to do so. 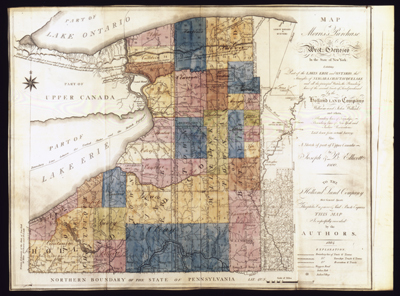 Please note that select microfilm reels, including all of the maps and all of the Western New York land transactions (indexed in Karen Livsey's Western New York Land Transactions, 1804-1824 and 1825-1835) have been digitized and are freely accessible on the New York Heritage website. See below for more information. We do not have the staffing to conduct extensive searches of the Holland Land Company microfilm for patrons. Patrons who are unable to consult the microfilm in person are encouraged to investigate the option of Interlibrary Loan through their local library. For additional genealogy resources, please visit the Genealogy Resources page. Researchers may now access many records of the Archives of the Holland Land Company in digital format. Housed on the New York Heritage Digital Collections website, these records include maps, land transactions and other materials digitized from the microfilm holdings of Reed Library. With the support of 2007 and 2008 Regional Bibliographic Databases and Resource Sharing (RBDB) Program Grants through the Western New York Library Resources Council, Reed Library staff digitized 1,363 color maps from the Archives of the Holland Land Company, featuring maps from the state of New York and the Western New York region as well as from other Holland Land Company holdings at repositories throughout the eastern United States. The Holland Land Company Maps can be viewed here. In 2016 an additional RBDB grant was awarded to Reed Library to digitize 20 select reels from the 202-reel collection, including the following reels (numbering based on the Pieterse Inventory; see below): 109-113, 123-128, 144-146, 175-180. This effort included those reels containing the Western New York land transactions referenced in Karen Livsey's Western New York Land Transactions (1804-1824 and 1825-1835). The Archives of the Holland Land Company collection can be viewed here. The Daniel A. Reed Library of the State University of New York at Fredonia remains grateful to the Gemeentelijke Archiefdienst van Amsterdam (Municipal Archives of Amsterdam) and the Nederlandse Document Reproductie B.V. for their collaborative roles in the original microfilming project of the Holland Land Company Archives completed many years ago. The Inventory of the Archives of the Holland Land Company, 1789-1869 by Dr. Wilhelmina C. Pieterse (Municipal Archives Amsterdam, 1976) provides detailed information on the contents of each volume in the microfilm collection. Available for download, the Inventory was reproduced with kind permission of the Municipal Archives of Amsterdam and Nederlandse Document Reproductie B.V. The Reed Library Archives & Special Collections typically does not hold the intellectual property rights for the materials in its collections. The Archives & Special Collections assumes that all requests for reproductions are made within the guidelines of the U.S. Copyright Office Fair Use doctrine and are intended exclusively for research and educational purposes. As such, the Archives & Special Collections will assume no responsibility for any infringement of copyright on the part of the researcher. When seeking to use any reproductions for publication, it is the sole responsibility of the researcher to determine the copyright status of the materials and to contact the appropriate individual(s) in order to gain permission to publish. Please consult this table from Cornell University for more information on determining copyright status. The following microfilm reels contain supplementary Holland Land Company materials. The reels are located in the Microforms Room of Reed Library. Patrons may access them at any time during normal operating hours.